Alhamdulillah that by Allah’s Rahmah (mercy), we are still in existence and Allah ‘Azza wa Jal’s Rahmah is dressing us, blessing us and forgiving us, InshaAllah. That, with oceans of difficulty everywhere, the turooqs (spiritual paths) and the people of haqqa’iq are a mercy from Allah ‘Azza wa Jal. They are a ship of safety and protection from Allah ‘Azza wa Jal, from Prophet (ﷺ ) and awliyaullah (saints). The guides describe a system, that if you follow that system, it will work. It’s a school; it has a curriculum. 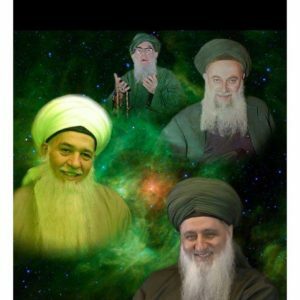 Their majlis and their circles are based on energy and based on teachings. The teachings are dressing the soul, the energies means coming from what Allah wants to send: He sends to the heart of Prophet (ﷺ ), from Prophet (ﷺ ) to the olul amr and those whom Allah granted them an authority. The guides come and they teach us always as a reminder that: take a path from your heart. Means take a path in which you follow your heart and not your head; and by listening to their guidance, they teach us. They teach us the tricks of shayaateen and the nafs, because the nafs partners with shaitaan and shayaateen. They are very clever on how to trick the believer into using their head and not their heart. And the turooqs come to teach that: use your heart and reach to where Allah wants us to reach. Reminder of the power of the heart is how we are going to protect ourselves. That everything the nafs is doing is through the head and then begins to fool us to make us to be busy through our head and to corrupt the heart. So mean s the whole way is based on understanding, that these thoughts that come to my head, and I should be taking a path that is based upon my heart. It’s not so simple as the nafs comes and tricks the believer openly but will in many times trick the believer that they are doing a noble cause, a noble cause. That they will do something noble and say, ‘This is in the way of Allah ‘Azza wa Jal‘ and enter into that. If that one is from the people of contemplation, they contemplate and contemplate that: ‘Is this something from my heart and a benefit for my heart or is this something coming through my head and I’m going to follow that which my head is commanding me?’ So as a reminder for our path is based upon the heart. That ‘I’m going to listen to my heart, I’m going to do my practices from my heart and continuously battle that which comes to my mind and try to take my path from my mind’, that we are a people of contemplation and tafakkur. In days of difficulty, many people begin to email and begin to try to communicate with the centre that, ‘I’m feeling a tremendous amount of negative energy. That I feel like I’m coming under attack and I feel that I’m becoming sick’. And that is correct, that there is a tremendous amount of negative energy everywhere and there is a specific way in which to combat that negativity. When we say we took a path in which we are nothing. 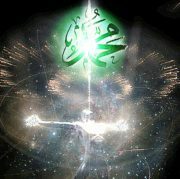 So means that, that nothingness is a means in which to reach towards Allah ‘Azza wa Jal‘s Support. If the servant believes in their somethingness, that they have an ability to defend against negativity, Allah will test them. Many negative things can begin to open and that servant will quickly understand that: you are nothing in the face of what Allah has created of unseen. The unseen that can make themselves seen or unseen that just like an energy begin to attack you from every means possible. So the first step in that reality is that: ‘I’m nothing, ya Rabbi, I’m nothing, I’m faqir (poor). That only by Your Grace and by Your Mercy, I’m in existence and that send Your Support’. And they begin to train, that in that training that you take a path within your heart; you have to build an energy. That energy is not your energy but that is an energy in which Allah send upon the heart of the believer. Everything and every reality is flowing from this ayat al Kareem (blessed verse). Our way is based on, ‘Ya Rabbi, I’m searching for Your Love, I’m searching for Your Protection’. And Allah ‘Azza wa Jal‘s Command to those whom He Loves, is “fattabi’ooni“- follow the way of Sayyidina Muhammad (ﷺ ). “Wa ma arsalnaka rahmatan lil-‘aalameen“; Allah ‘Azza wa Jal says: ‘I would not have sent the reality of Prophet (ﷺ ) except that it is a mercy towards all creation, all existence, all worlds, everything Allah has created. Its mercy is in the way that Prophet (ﷺ )’s existence can bring the power of Allah ‘Azza wa Jal in an energy that is acceptable for us to receive. Allah’s Qudra, directly, it will burn everything. But when this Qudra hits to Prophet (ﷺ )’s soul, it becomes cool and peaceful and a means in which people to reach towards that energy. That’s why Prophet (ﷺ ) described them: ‘Remember me at least one time, make Durood e-Shareef upon me at least one time, Allah will allow my soul to come and make 10 salawat‘. Allah, through Prophet (ﷺ ) is giving to us a formula from Allah ‘Azza wa Jal, that this Durood e-Shareef means the light of Prophet (ﷺ ) begins to dress our soul, bless our soul. That is a qudra (power), that is an energy that dresses the reality. It means then the spiritual guides take a way of tafakkur and contemplation, that we must accompany those people who are the people of tafakkur. That’s why we started the talk with the people of the brain [head] and people of tafakkur [heart]. 99.9.9% of people are people of the brain: whether they are imam, whether they are an ‘aalim (Scholar), whether they think they are Sufiya or they are ahl ul-haqqa’iq (people of reality); they are using their brain. Most have not trained to use their heart. The way of the heart has a very specific training in which they took a bayah (allegiance) and they accompanied a shaykh. They accompanied a shaykh for many years of their life in which that shaykh continuously tested and continuously crushed them, and crushed them and crushed them. So that of their mind and of the path of which they use their head, was destroyed. And they became the people in which they use their heart. They had continuous testing. And those who inherit from that, they are also authorized in that form of testing. That as much as you accompany them and you be with them, whether through form or through the internet, means they continuously test you not to use your head, not to use your head: use your heart. So that everything that coming to your head, battle that thought that comes to your head and begin to use the tools that were given to you for your heart. So means these people are different. These realities are different. The people of the heart and the opening of the way of the heart through all their training, they teach you that when you sit for tafakkur, negate yourself, negate yourself. Those who are watching and concerned with energies, you don’t have an energy in which to protect yourself against negativity because it’s not about my energy to protect myself. It’s about me negating myself to be nothing. If I can reach a state in which I’m nothing, then Allah dresses from “ateeullah wa atee ar-rasul wa Olol amrin minkum“. 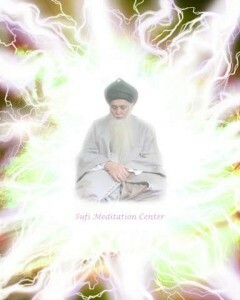 Means those lights are the lights in which the believer needs within their being. Means Allah ‘Azza wa Jal, “Ittaqullah wa kunu ma as saadiqeen,” that have a consciousness and keep the company of the saadiqeen, keep the company of truthful servants. We said before, Allah’s Words of Holy Qur’an, is for all time; that we must keep their company physically and spiritually. As you are keeping the company physically, they train you on how to keep their company spiritually. How to enter your tafakkur and contemplation, how to negate the self. That, ‘Ya Rabbi, I’m not here to listen to myself. I’m asking to be with Your truthful servants, whom are truthful in their word and in their deed’. Means their lights and their arwah are everywhere and the light of their soul is free. 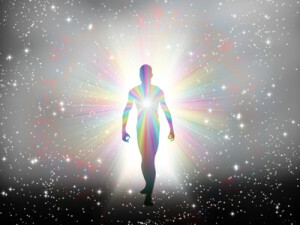 How to connect with that light, how to connect with the energy of that reality, to be dressed from that? Before you can reach to “ateeullah“, before you can reach to “atee ar-Rasul“, means that we must be accompanying and keeping the energy of “Olol amrin minkum“. By negating myself and taking a path in which I negate myself is to reach the energies of these Olol amr; that wherever they are, how to reach to them, how to be dressed by them, how to be dressed by that energy. Asking that: send your madad, send your support. This is not worshipness. When people come back and make comments, ‘Is this like a shirk, is this like a worship?’ Worship is only for Allah ‘Azza wa Jal. This is for support in which Allah is continuously telling us, that only people of tafakkur understand these realities. And keep the company of truthful servants, not only physically but in spirituality, by being nothing, by being nothing and asking for their madad. The guides begin to teach you a specific way in which to train yourself. That to lock off your senses, close off your eyes, close off your ears. Enter into a station like the qabr (grave) in which you enter into a room with just a candlelight and be nothing. In that nothingness, how to be dressed by that light, call upon these Olol amr. And Have a dialogue and a relationship with the shaykhs in their spirituality. Say that, ‘I’m nothing Sayyidi, that you be with me, it’s not necessary for me to see you, but I know that you are there with me. Dress me from your light, bless me from your light’. With all your belief, that in every salah (daily prayer), [know] that ‘my shaykh is my imam. He must be there to be present with me, I’m not worthy of seeing’. Don’t busy your mind keep saying, ‘I wanna see you, I wanna see you,’ and then you get upset when you don’t see. You are not worthy of seeing them. Don’t give your nafs (ego) in anything that you do, any type of happiness. They said that Imam ‘Ali (alayhis salaam) described that, ‘Even in my annihilation, there is an annihilation’. Means that, if in your tafakkur, you contemplate and somebody sends a khashf, like a vision comes and awliya (saints) show something. You are sitting and meditating and all of a sudden, oh they come with a jubba (robe) from paradise, they come with the swords of paradise, they come with a water from paradise. And you want to come to the shaykh and talk about it- why? Why would you give your nafs (ego) any credibility? Why would you give your nafs any ability to understand what’s taking place and give it any type of credit? Even in your annihilation is to annihilate: ‘I’m nothing, that what I’m seeing, ya Rabbi, is not for me, I’m not worthy of that, I’m noone. My nafs is even playing with me on these subjects’. And if it’s real, Alhamdulillah, Allah knows what’s real; it’s only for Allah to know. And if it’s not real, at least you negated your nafs playing with you. There are so many different trainings. As they are training you to be nothing, to be nothing, then Allah (AJ) reminding us: keep their company. The physical company but the spiritual is much harder. 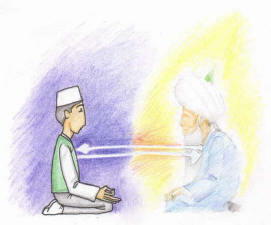 How to continuously keep them under that nazar, (gaze) that, ‘Be with me, dress me from your light’. The guides begin to remind you that, ‘We can’t be with you if your character is bad’: “Qul jaa al-haqq wa zahaq al-baatil“. The truth and the false: we don’t go together. Then they motivate that: keep your character to be correct, keep your character to be clean. Keep your reality to be a truthful light because then their truthful light can accompany. But their truthful light doesn’t accompany anything false. Means the whole science of this reality on how to negate myself, how to keep their company, how to with all my faith like a mountain, but he’s present with me. Shaitan is present with you. And what power shaitan is taking? Shaitan takes from ‘Izzatullah, ‘izzat ar-Rasul wa ‘izzat al-mu’mineen– he’s taking from the power of the mu’mineen. So means these Olol amr much more powerful than shaitan. So they are there, they are right in front of us: we can’t see them. Why can’t we see? Because of the bad character, because of the trick that shaitan and the nafs is putting upon the mind and blocking the mind and distracting the heart. 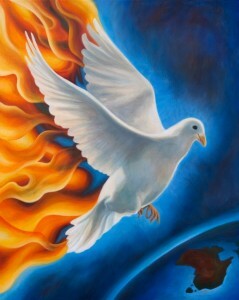 But with all my faith that they are, and with all my faith asking, dress me from your light, bless me from your light. As you negate yourself, their light is dressing, their light is dressing. If they begin to dress on the soul, you be dressed now with a qudra (power) because ‘La hawla wa la quwwata illa billahil’aaleeyil ‘Azheem‘. 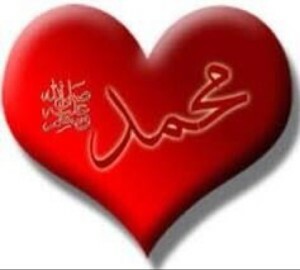 Means these Olol amr, they carry the lights of Prophet (ﷺ ). Prophet (ﷺ ) is the ocean of Allah (AJ) ‘s Qudra (power). Means the hawla and support is coming by these Olol amr, the ones we see and the ones we don’t see. Their power is everywhere. So for the believer, Allah (AJ) is challenging us: connect to that unseen power. As soon as you negate yourself and you make a path of tafakkur, it’s like you are searching on how to plug in. Then all of their teaching will be on how to bring everything down and how to connect to their energy. By connecting to their energy, you begin to feel a fa’iz and a dress upon the soul. Haqiqat al-juzba (Reality of Attraction), from the powers of the heart, there are 6 powers of the heart that awliyaullah (saints) will open upon the heart of those whom following. 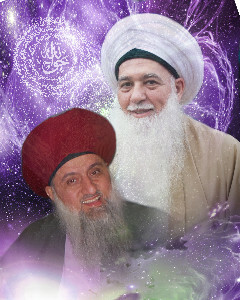 The heart, the power that we are talking about now as a defense against difficulty is haqiqat al-juzba– how to bring an energy upon myself greater than my own energy. The way of tafakkur is that when you begin to train on how to contemplate, how to contemplate, they begin to teach you: purify your inside, correct all of your inside. And that this iron within the body that Allah gave to you, perfect and cleanse your iron so that the iron within your being is perfected and clean. What you eat, what you drink is going to affect that. Once you begin to take a path in which you clean this iron and now you want to connect with that energy, they begin to teach: negate yourself and ask to be with these Olol amr. ‘Ya Rabbi, the awliyaullah that are always present, I’m asking for their support, asking for their madad, that let my heart to be connected with them and with all my belief, I believe that they are present with me’. And begin to ask that, ‘Dress me from your light, bless me from your light’. Our way is based on how much of that light we can take. How much of that good character that we can develop, so more and more light come, more and more fa’iz comes. When they begin to dress that being, all of their energy is now charged. It becomes supercharged. The more energy that you can bring upon yourself, from “Ateeullah, wa atee ar-rasul wa Olol amrin minkum“, because we are going up this way upwards. 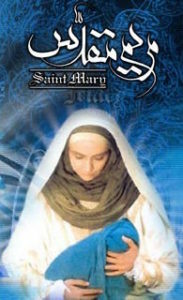 As much as we keep the presence of the Olol amr and the dress of the Olol amr (saints), they are perfecting our lights. In your tafakkur and contemplation, you visualize that the Olol amr are there and you begin to be able to feel their energy and ask to be dressed by their energy. The Ulul Amr are cleaning, perfecting, cleaning, perfecting, to take us to the presence of Prophet (ﷺ ). So when that energy is perfected, they take you to the presence of Sayyidina Muhammad (ﷺ ). Ruhaniyat Nabi (Prophet’s spirituality) (ﷺ ) must be present, in that ruhaniyat, that Prophet (ﷺ )’s fa’iz (downpouring blessings) begin to dress the believer, Prophet (ﷺ )’s lights begin to dress; and they begin to change even the colour of the light that being dressed upon them. That is the lights of protection. As much as we can negate our self and bring these lights that this being becomes charged with an energy that pushes away many shayaateen, pushes away many different beings that have a bad intention. If the energy within the person is not strong enough, everything can begin to attack it, and now many people are feeling an attack. They feel the negativity is coming everywhere and they feel they don’t have the ability to push the negativity away. And all of these practices and all of these trainings was not for entertainment, but to prepare people for difficulty that coming upon this earth. What they want us to understand is: you have to negate yourself. As much as your self is there, that energy is not. When we negate that, ‘Ya Rabbi, I’m nothing. Ya Rabbi dress me from their power,’ as soon as you ask for the madad, these awliyaullah (siants) must be present. 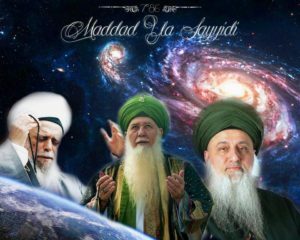 They are here to serve Allah and serve Sayyidina Muhammad (ﷺ ). We are not seeing them, it doesn’t matter; but we are asking to be dressed by them, blessed by them, that, ‘Dress that light upon me. Let me to begin to feel myself in these oceans of light’. Every association is under their dress; every salah (daily prayer) is under their dress. Means then we begin to understand that the importance of these associations and th e importance of these teachings, they are not everywhere. These associations and the light that these associations have, they are an authorized association. Every time you step in that association, they are going to dress you. And every time you miss the association, the dress is very light upon you. If they can’t send enough in the time that been given to them, you don’t have the ability to carry it. That’s why when you think you can miss and do whatever you want, you are not taking the dress that Allah has destined for you. It’s a dress. If they send too much, you’ll be sick, you’ll have flu, you’ll enter into a state like death- it’s too much for the physicality to take at any one time. So every association has a dress from that reality. Every association has a preparation for what is coming because we are jahl (ignorant) and we don’t understand and we don’t see. We think everything is just blue, everything is just great. But something is coming. Difficulty is coming. If insaan (mankind) doesn’t build themself and their soul, they have no way of surviving what’s coming, which is okay too because if they take you and get rid of your body, they’ll bring your soul to witness that reality. But we would prefer to witness it with body and with soul. Then the training is important; the lights are important; these realities are important. Not every place is the same. One example of that with, I’ve told before, is when Sayyidina Zakariyah. Sayyidina Zakariyah (Alayhis Salaam) is a prophet of Allah and all his life making a du’a, a specific du’a that was not answered. So means that how ever pious you think you are, there is something specific that Allah wants you to learn. Sayyidina Zakariyah, 99 years, how old was Sayyidina Zakariyah? Not getting the du’a, not getting the du’a (supplication), until he walked into the niche of Sayyidatina Maryam (Alayhis Salaam). When he walked into the niche of Sayyida Maryam (Alayhis Salaam), he’s witnessing now that there are many things happening in this niche. Although his whole life is in his temple. His whole life is in his temple; the niche is inside the temple. The niche is inside the temple. So it’s not a matter of just you are anywhere, you’re in the vicinity. No, no- Allah (AJ) is very specific. His whole life he is in the temple making a du’a and it’s not being granted, because Allah wants a whole package. His du’a is not granted until he walked into this room, which requires humility because he’s a prophet of God and she is a waliya (saint). And he recognizes that as a prophet of God, because you have to be humble: my du’a is not coming, but this person seems like all their du’as are coming. Every ni’mat is flowing, every food is in abundance that even he’s astonished and asked, ‘Where is this food coming from?’ And she is surprised, ‘What do you mean where is this food coming from? You don’t know? You are a prophet of God!’ At that moment he made du’a, and at that moment Sayyidina Jibra’il appeared to him and said, ‘Your du’a was accepted’. So why you go anywhere, you make du’a? That doesn’t make, it’s not correct. Not anywhere you go Allah’s Secret would be there, that Allah has Secrets. When you use your heart and not our brain: your brain says, ‘Go everywhere, you are holy; wherever you step, everything will happen’- no! When you use your heart and think that maybe Allah (AJ) has placed a secret; based on that secret I’ll go there and make my du’a. Based on that secret, maybe their teaching is something that my soul is in need of. Because everywhere else I go I’m hearing the same thing through my head; for 30 years I heard the same thing, and they keep repeating it through their head for 30 years. But there is a reality from the heart; and the people of the heart, they carry a signal in which Allah ‘Azza wa Jal, Prophet (ﷺ ) and Olol amr are now transmitting that signal. That signal, when you pick up their teaching, it’s a dress upon the soul. It’s a blessing upon the soul. It’s a preparation for the soul. And their associations are not like regular associations. Their associations have a secret and that if they enter into that secret, they will be dressed by whatever they eat in that niche, whatever they drink in that niche, whatever du’a they make in that niche, maybe Allah (AJ) will accept it there. Subhana rabbika rabbal ‘izzati ‘amma yasifoon, Wa salaamun ‘alal mursaleen, wal hamdulillahi rabbil ‘aalameen. Bi hurmati Muhammad al-Mustafa wa bi sirri surat al-Fatiha.